Posted on Mon, Feb 20, 2012 : 9:48 a.m. 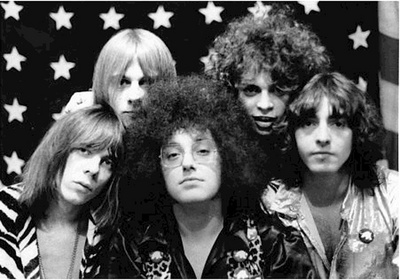 The MC5, with Michael Davis at right. Rolling Stone and other outlets are reporting the death of Michael Davis, bassist for the inflential Detroit / Ann Arbor band MC5, of liver failure. He was 68. A Detroit native, Davis was recruited into the band while studying art at Wayne State University. Although initially based in Detroit, the MC5 moved to Ann Arbor in the late 1960s and were a core part of the scene surrounding the White Panther Party, led by John Sinclair, who was also the band's manager. Later, Davis played in Destroy All Monsters with the late ex-Stooges guitarist Ron Asheton and Mike Kelley, who also recently passed away. Read the Rolling Stone article here. Read an obituary from the Detroit Free Press here. Tue, Feb 21, 2012 : 5:39 p.m.
Tue, Feb 21, 2012 : 11:32 a.m. So no local story on this legendary musician who lived and performed in the A2 area for years? I'll miss you Mike!!! I enjoyed the fun we had when I moved to AZ. You were a fun loving guy &amp; thanx for letting stay with you.